Well, I am in North Carolina taking a class at John Campbell Folk School. I wanted to get out of town for a few days and take a class somewhere, so I ended up here at the School making a split bamboo fly rod. Can you say obsessive, detailed, fanatic, “are you kidding me”? If you have a dime in your pocket, turn it over and look at the “o” in “of America” and the center is 0.070 inches. That is 70 thousandths of an inch, the size of the end of a good fly rod which is built up of six perfectly shaped equilateral pieces, all of which are half the thickness of the “o”. And then five inches further up the rod, it is 0.005 thousandths thicker. The rod tapers from one end to the other and the taper determines the action of the rod when casting. People can tell you the name of a particular taper and what kind of action it will provide. Fly rods are made of a particular bamboo imported from southwest China. It takes seven years to grow big enough to be split and made into a fly rod. Suitable bamboo only grows on the south facing slopes of alternate hills facing a river and can only be harvested by unmarried Chinese maidens. It is then shipped to the US by a select few importers and sold to fly rod makers all over the States. Some of that I made up, but from what I see so far, all of it is believable. 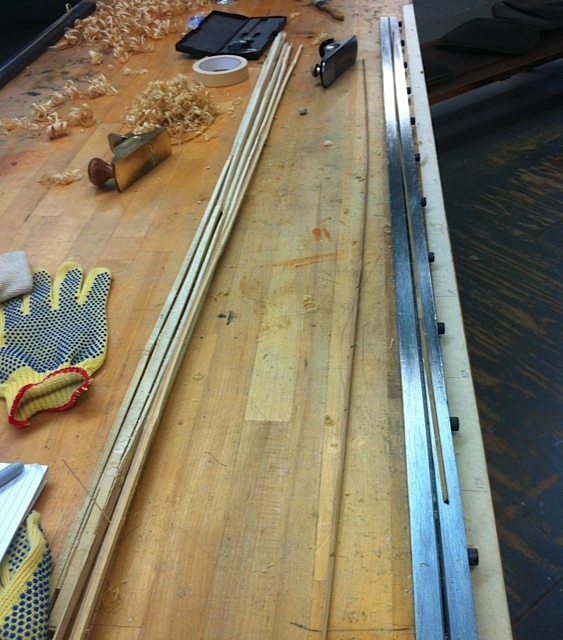 Let me tell you one thing I know for sure after two days of hand planing bamboo strips in metal taper forms. The guy who invented bamboo shoots under the skin as torture was likely making a bamboo fly rod. This stuff is sharp!! First class I have ever been to where on the second day half the class brought their own box of Band-Aids. When the whole school eats lunch family style, our table mates know what class we have because we all wear bandages on our fingers. Tomorrow we will glue up one section and continue planing the other section. After that we can make the handle and add the ferrules and the line guides and all the other stuff which I have yet to learn. Wish me luck. I may still have to go buy another box of Band-Aids even at that. I will post a picture when I get done.